Complete new missions to unlock over 16 all-new weaponised vehicles that you can drop in at a moment’s notice. Experience new levels of destruction, attack missions in never before seen ways, employ new tactics against the forces of the Black Hand and cause pure mayhem in the world of Solis. 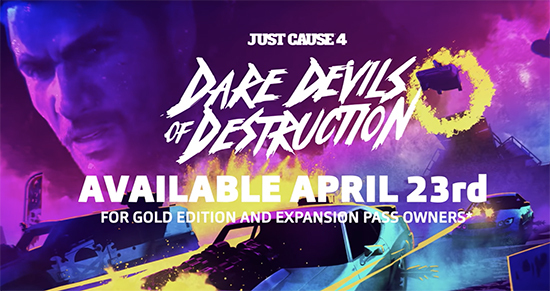 Gear up for an adrenaline fuelled adventure in the all-new Dare Devils of Destruction DLC for Just Cause 4, releasing April 30th, 2019, on Xbox One, PlayStation 4 and Windows PC.